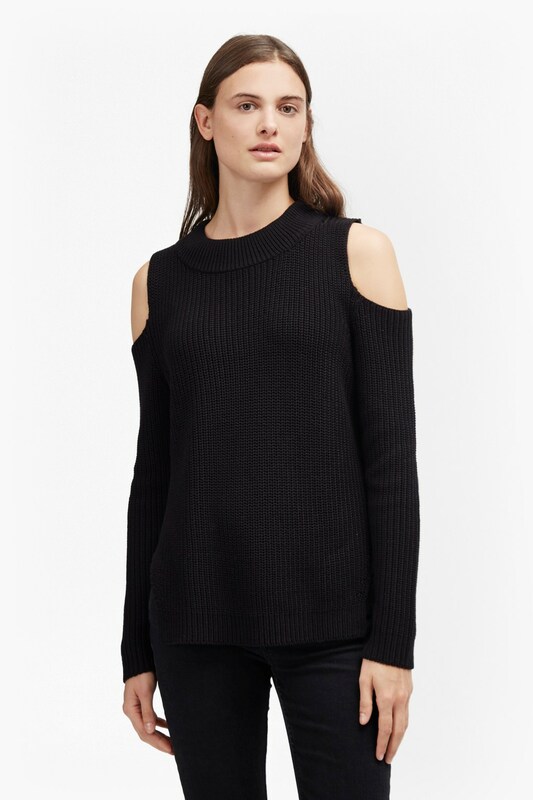 Cold shoulder sweater by French Connection. My favorite look this summer was the cold shoulder. I was thrilled to see it make it into Fall, and even more pleased to find this sweater at French Connection. All their knits are 25% off right now. The side slits and longer length make it very flattering. The material is so soft, you won’t want to remove it. You can purchase it on sale now here. Not only does it look great with jeans but I plan to wear it with a long black skirt, and heeled boots. Giovanna Battaglia, photo via NYTimes. Fall is here. What will you be wearing? So I re-found my denim button down and that’s all I want to wear! oh and loose, boxy tops and my new Laurentian mocassins that I scored at the thrift store! But for real, I need 5 denim shirts. I want in on that! I just ruined mine with my dumb home made coconut oil deodorant!